Lunchtime one day every other week is anticipated with great excitement for K-3 English Learners at Washington School. 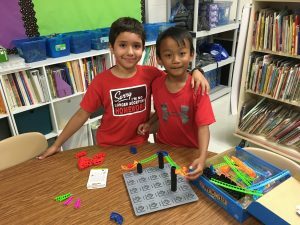 That is when Amy Kovarik, K-3 English Learners (EL) teacher, has a growth mindset game club. Started last year with the support of a grant from the Student Excellence Foundation, the club has proved to be a big success. Growth mindset is the belief that skills and intelligence can be developed through hard work and perseverance. Many students in Ms. Kovarik’s class come to school with a fixed mindset: they think success at school is beyond their control. The grant allowed Ms Kovarik to purchase games that help teach growth mindset skills and behaviors. 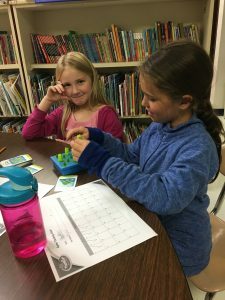 One of the goals of the growth mindset game club is that students learn that even if they struggle they can succeed if they just keep trying. The club is divided into eight sessions that include 20 EL children. After a session ends a new one begins allowing Ms. Kovarik to serve more children. It is totally voluntary: it is a club, but so many children want to attend they have a waiting list! While the children eat their lunch a story or video is given to help frame the lesson for the hour. They are then given games that are appropriate for where they are in their own growth mindset progress. 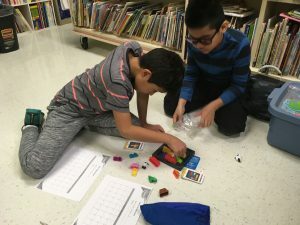 The games are not dependent on language skills; they are board games that require some form of reasoning and “figuring out.” Ms Kovarik explained that since it is a club and not dependent on language or math it levels the educational playing field. All the students are at the same point when they begin. The “games” they play give them a new way of looking at problems and how to solve them. Through these games the students learn a more positive way to not only resolve challenges but also how to positively express themselves. Ms Kovarik said that many of the teachers at Washington are using some form of growth mindset development in their classrooms. Two of the positive outcomes from the growth mindset game club were: students developed positive attitudes about learning new and difficult things; and students became supportive of each other, coaching and encouraging, using growth mindset phrases they had learned. One of the heartwarming stories was how some students who are passive in class became active and excited to share strategies with fellow club members: “they saw themselves as capable and intelligent.” The support of this grant has expanded learning opportunities for many English Learners who may struggle in their regular classroom.